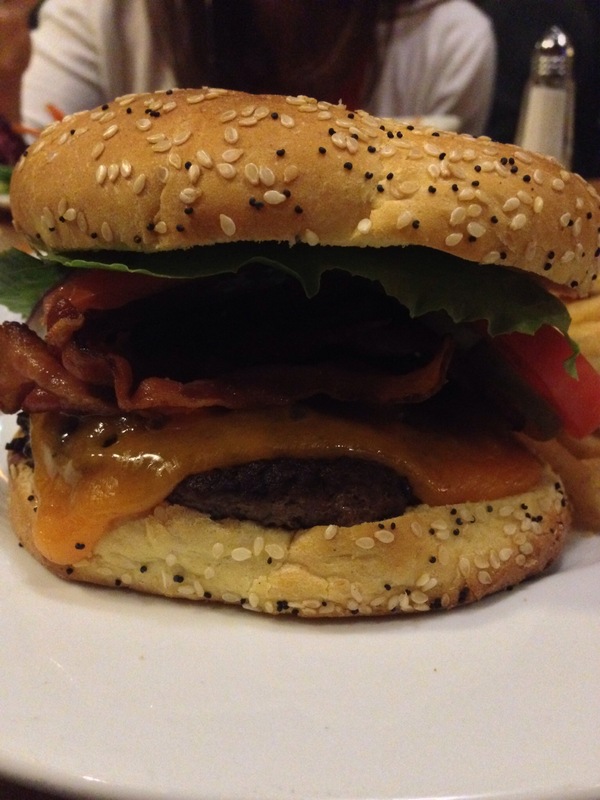 When this burger was placed in front of me, I had mixed feelings. On the plus side, the veggies looked really fresh and the bacon looked like it was cooked just how I like it. However, I was somewhat disappointed with the size of the burger patty as it did seem to be a bit on the smaller size. The presentation of the food on the plate wasn’t anything special, and I feel a little more effort could have went into that aspect. Either way, I was still curious to see how it held up in the taste department. After the first few bites, I decided that I wasn’t super amazed by this burger. Don’t get me wrong, the burger was tasty, but it just didn’t have anything that really made me say ‘wow’. 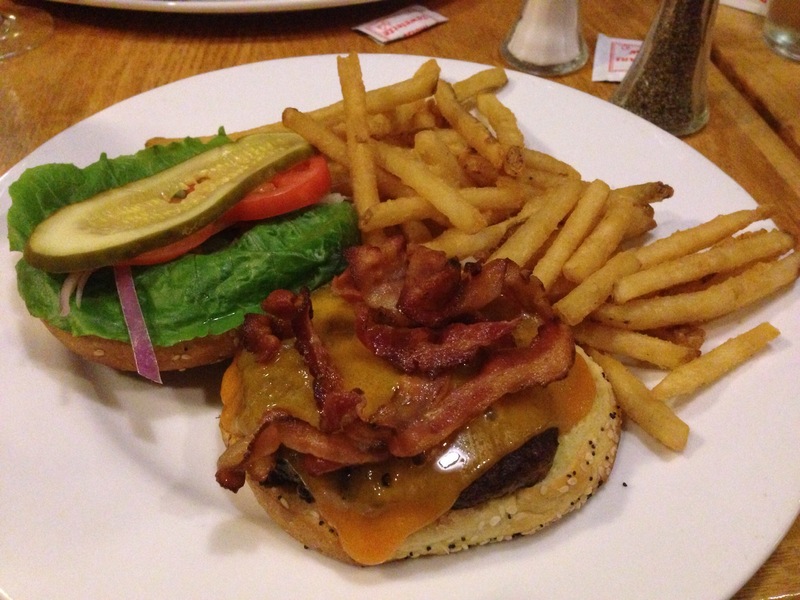 This burger was your typical bacon cheese burger, and it didn’t really have anything that would allow it to stand out from the rest. It felt more so like it was added to the menu so that there would be another option for the non-seafood fan, and at a place like this that specializes in seafood, I feel like it doesn’t get the attention that some of their more specialty dishes do. 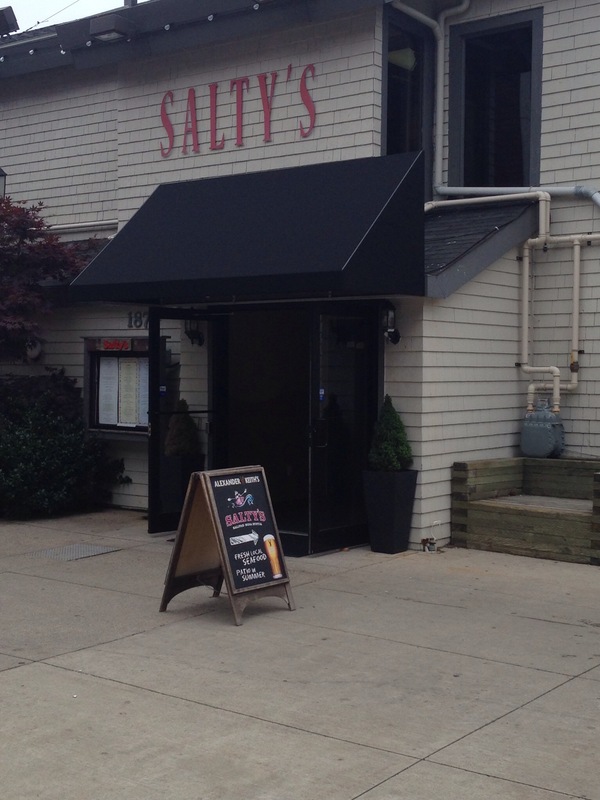 This was my first visit to Salty’s, even though I work just down the boardwalk from it. They do have a quite large outdoor seating area that overlooks the waterfront, but it was kind of chilly the night we were there so we sat inside. The staff were friendly and accommodating. We were a somewhat large group, which can sometimes cause wait times to be increased, but it didn’t really feel like that long of a wait to me (that could partially be due to the fact that they always made sure our drinks were full). It wasn’t that busy during our visit but I wouldn’t be surprised if this place does get pretty full at times, given its prime tourist location. The price of this burger is $13.95. For such a basic burger, this is a little high. There were really no premium or unique toppings, and the patty was on the smaller side. In my opinion, the price should be knocked down a bit, but given that Salty’s is in an area that gets a high volume of tourists, it makes sense that this burger would come with this price tag. This burger didn’t really leave a strong impression with me. It didn’t taste bad or anything, but it was just very basic and lacked excitement. It is good that they provide some non-seafood options, but there just seems to be a lack of effort with this burger.